The subprime mortgage meltdown left a bad taste for many investors who could not get rid of their toxic securities before 2008. A few investors, however, properly hedged themselves by holding on to derivative products that essentially waged on the failure of the subprime mortgage-backed securities. One of these investors was Goldman Sachs, the investment banking firm that gained notoriety for betting against the same marketplace it helped create. Goldman Sachs is now encouraging investors to take positions in certain asset-backed securities index (ABX) products that contain mortgage bonds not guaranteed by government-sponsored entities like Fannie Mae and Freddie Mac. While in 2006 Goldman Sachs invited top clients like billionaire investor John Paulson to short the American housing market, the Wall Street giant is now advising investors to go long on subprime. 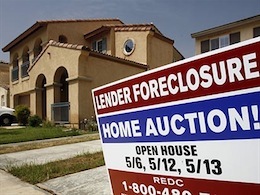 A considerable percentage of the millions of mortgage defaults and foreclosures in the United States since the first decade of the new century have involved a subprime home loan. Investors whose portfolios included securities backed by risky subprime mortgages have been writing off losses for a while; many of these investors are institutional players like state pension funds and insurance companies. Not all subprime mortgages, however, ended up in default. ABX investment products that feature mortgages that are not guaranteed by Fannie and Freddie have gained 39 percent in value this year, according to the Markit Group of London. These ABX products are tied to mortgages originated in 2006. Goldman Sachs is not the only Wall Street player that is seeking to profit from the burgeoning recovery of the U.S. housing and mortgage markets, even if that means taking a chance in risky subprime home loans. LibreMax Capital LLC, an investment hedge fund managing firm, has realized 19 percent in subprime ABX holdings. Barclays PLC estimates that ABX products that feature subprime mortgages originated between 2005 and 2007 have recently appreciated 33 percent. These are subprime mortgages did not end up in delinquency, default or forbearance. The fact that Goldman Sachs has performed like the two-faced Roman deity Janus when it comes to investment opportunities tied to subprime mortgage products does not sit well with everyone. Michigan Senator Carl Levin has questioned the firm's practice, which essentially amounted to betting against their clients' holdings. Goldman Sachs has thus far asserted that its conduct as an investment banking firm was appropriate. Goldman Sachs, however, has elected to settle claims from the Securities and Exchange Commission that it had tricked some investors in the days leading up to the subprime mortgage meltdown. That settlement cost the Wall Street leviathan $550 million. In the end, investing in bonds tied to subprime mortgages in a zero-sum game: Some need to lose so that others will gain, but the odds and the risks are higher.